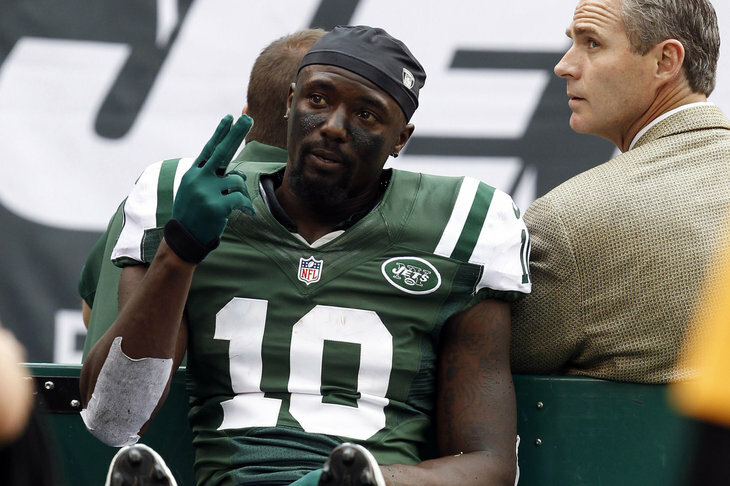 A person familiar with the situation says New York Jets wide receiver Santonio Holmes has a Lisfranc injury to his left foot, meaning the team’s struggling offense probably will be without its top playmaker for the rest of the season. Holmes went down on the first play of the fourth quarter of the Jets’ 34-0 loss to the San Francisco 49ers on Sunday after catching a pass. X-rays on the foot were negative, but subsequent MRI exam results were sent to a foot specialist in North Carolina. The Jets’ fears were then confirmed, according to the person who spoke to the Associated Press on condition of anonymity Tuesday night because the team had not announced the severity of the injury. Holmes was the best player left on a team that had already lost its best player, Derrelle Revis. That leaves only Mark Sanchez, Antonio Cromartie, and Timothy Richard Tebow as active Jets anyone’s possibly heard of, and they haven’t necessarily heard of those guys for the best reasons. There’s little argument that Holmes’ departure seals the fate of a team already showing signs of being dead in the water. With their current 2-2 record, the Jets can’t be historically bad, but there’s absolutely nothing keeping them from being epically bad, and they’ve taken more than a few bounding steps down that path. The problem is that the pump arguably was primed for that destiny before the season began, before Revis and Holmes got injured, before Sanchez and Tebow gave us evidence of their stunted development as professionals, before Cromartie donned 2011 Holmes’ locker-room-killing mantle. Now we’ll never know for sure whether this Jets team, fully healthy, still would have been capable of the type of losing they’re in for. Not only does Holmes’ season-ending injury leave us irretrievably in this alternate-1985 reality, though. The real lament is that history will note the injury as an explanation, a rationalization, even a partial justification of what is sure to be a disastrous Jets season when these Jets were capable of such beautiful losing all along. This entry was posted in ALDLAND and tagged ap, arlo guthrie, back to the future ii, bob seger, calvin & hobbes, derrelle revis, jets, mark sanchez, music, new york, nfl, santonio holmes, tim tebow by AD. Bookmark the permalink. In other AP lamentations: http://www.google.com/hostednews/ap/article/ALeqM5hOTzabzKG0DRJOQjpf-oxLW_fiUw?docId=e34af1cc42df46ce87455187d3cb11e6.